Based in Chicago, Advance Window Corp. specializes in manufacturing and wholesaling vinyl windows and doors. It has been in the business since 1995 and is one of the fastest growing window companies in the nation. Accordingly, they attribute their success to their fast production time, high standards in quality control, and excellent customer service. The company’s goal is to offer clients with value-filled products supported with state of the art machinery and equipment at affordable prices. All their windows can be customized to fit in with all modern window design trends, whilst maintaining adherence to residential and commercial building codes. Company window products are diverse with a variety of color and style combinations. Special designs employing architectural shapes, bay and bow windows, and the European tilt and turn window line are also available. The double-hung windows have sloped sills to facilitate drainage while maintain a wooden look. The picture windows, on the other hand, have beveled external surfaces and designs that can be paired with double-hung sightlines for uniformity. The two and three lite slider windows, also called gliders or rollers, are perfect for wall openings where width is bigger than height, such as the spaces under standard windows. Indeed, these can add light to any room thus, increasing home comfort and value. Large and small casement picture windows are perfect for homeowners who want casement or awning style windows without the openings. 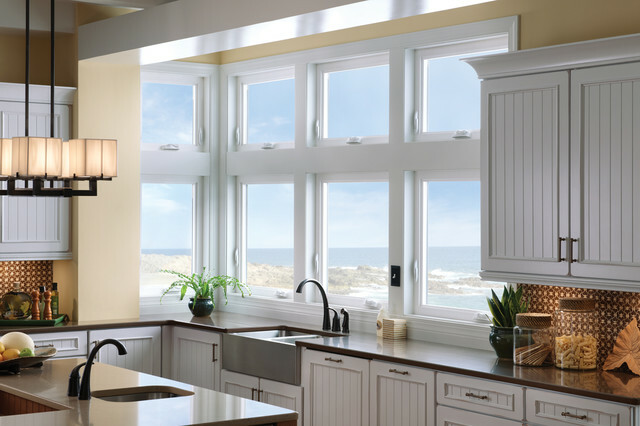 Simply put, these are fixed casement or awning windows and can come in various, custom sizes. At this point, it is imperative to note that hopper windows can be easily confused with awning windows. To differentiate, awning windows are hinged at the top and open from the bottom up. Hopper windows are conversely hinged at the bottom and opens at the top. All Advance Window Corp. windows are rated by ENERGY STAR, and the NFRC. Windows are covered by a non-prorated, limited, lifetime warranty. Owners who have the company’s windows installed in their homes are qualified for the Federal Tax Credit.